It was a sunny August day when I chose to prune my Bottlebrush Buckeye (Aesculus parviflora). I had just started when a loud buzz , followed by dive bombing, caught my immediate attention. Thinking I had nearly stepped on a bumble bee nest, I took off at great speed. I waited for 10 minutes then crept back, hiding behind some beech trees. I peered carefully around but the area under the Bottlebrush was clear. There were no holes or clumps of weeds or grasses that could be a nest. Puzzled, I scanned the area slowly. There it was perched on my clump of Purple-flowering Raspberry (Rubus odoratus), a large but very weird big-eyed bumble bee. Staring intensely and directly at me, it did not move. I decided to slowly edge over to collect my dropped pruners. All went well until I grabbed the pruners. I was given another buzz by, but since I was not stung, I decided it must be a big male bumble bee, guarding flowers and waiting for a mate. Over the next week, he dive bombed anyone who got too close, even the dog! Then one sunny day I spotted him holding a Japanese beetle close to his furry face while resting on a leaf. What could he be doing? I was allowed to get close enough for pictures with my dinky little camera. Bee-like robber fly, Laphria thoracica. Photo by Renée De Vry. I sent the photo to a friend who informed me it was NOT a bee. It was a robber fly in the Laphria genus, later confirmed as thoracica, one of three common yellow and black robber flies in our area. Size indicated that “he” was likely a she. Males are not only smaller but have bushier beards. This bee mimic prefers beetles for lunch, but will happily eat anything that flies by, even bees and wasps. The female lays eggs in the soil where her larvae predate on beetle grubs. Adults emerge from July to September. Laphria spp. prefer woodland glades or edge habitat common in urban areas. 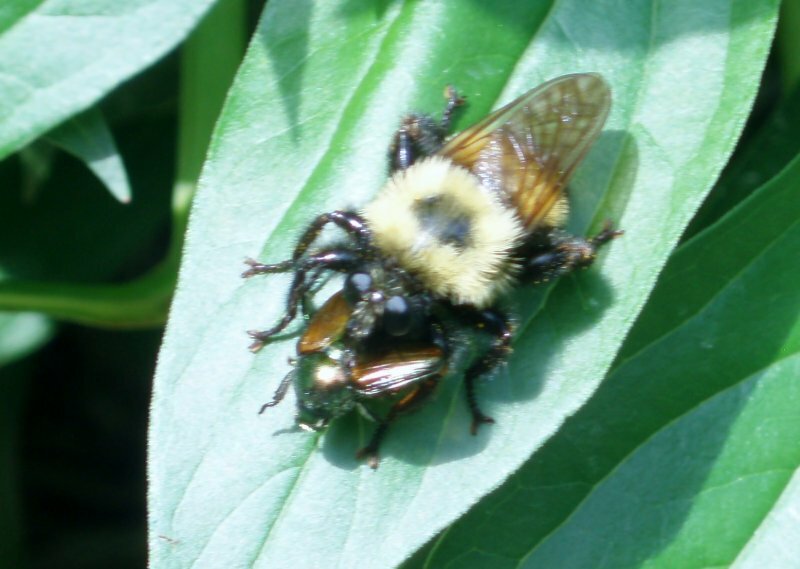 A robber fly (Laphria thoracica) that looks like a bumble bee. Photo by Greg Shchepanek. Click image for larger view. How does one tell the difference between a bumble bee and this robber fly? Antennae – Robber flies have short bristle-like antennae. The bumble bee has longer floppy or bent antennae. Eyes – Robber flies have large half-sphere eyes that almost meet. 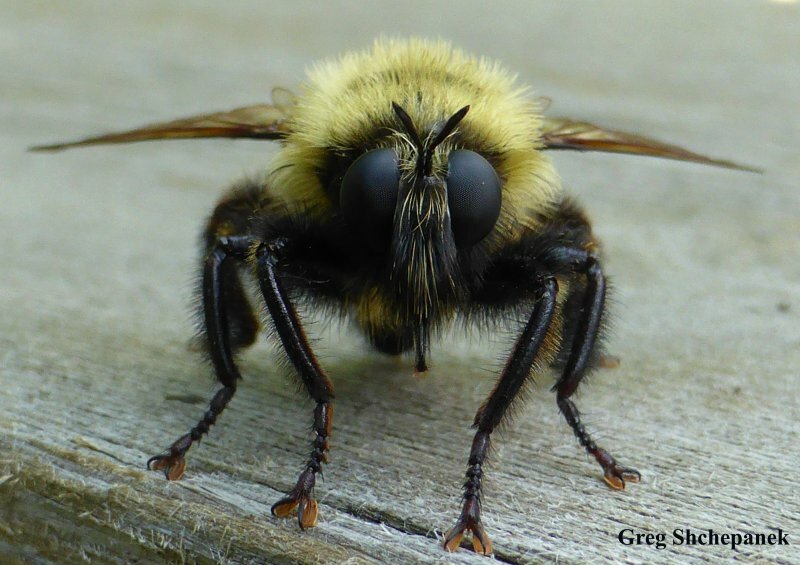 Bumble bees have tear-drop-shaped eyes on the sides of their heads. Feet – Robber flies have 2-toed padded feet. Bumble bees have hooked feet. Wings – Robber flies (like other flies) have 2 wings. Bumble bees have 4. Diet – Robber flies are carnivores. Bumble bees are vegetarians. Robber flies can be a good indicator species for healthy insect numbers. So cherish your robber flies, as we could all do with fewer Japanese beetles. Renée De Vry has a wealth of experience growing native plants and is a keen observer of the creatures that use them. She managed the Meditation Garden at the Unitarian Church on Cleary for 20 years. Note: Although robber flies are not pollinators, we should know about these mimics and not mistake them for bumble bees. A very interesting story… I like your first reaction “to run”. Then to understand. They eat grubs, they pollinate and they don’t bite people.